Apple has warned that anyone attempting to unlock their iPhone to use with an unauthorised mobile network could find their phones irreparably damaged. 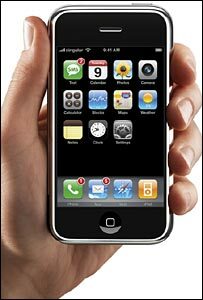 The company said that modified mobiles would become "permanently inoperable" once Apple updates were installed. It follows a flurry of hacks claiming to unlock the phone, which is tied into the US AT&T network and O2 in the UK. Apple has denied that it is "doing anything proactively to disable iPhones that have been hacked or unlocked". The warning will be seen as a pre-emptive strike by Apple in the ongoing battle with hackers who are increasingly making unlocking software available to iPhone users. Unlocking the phone allows iPhone owners to use the phone with the network operator of their choice rather than the authorised ones chosen by Apple. "Apple is saying that if you buy the iPhone and unlock it, you could preclude yourself from getting new features. Apple updates might not install properly and you could find that you own a £270 brick," said Ben Wood, director of research firm CCS Insight. At the launch of the iPhone in the UK, Apple boss Steve Jobs admitted that the firm was engaged in a "game of cat and mouse" with the hackers. He added jokingly: "We're not sure if we are the cat or the mouse." Unlocking the phone has also created a growing market for unauthorised applications, including wallpaper and ringtones. Mr Wood said he thought the way Apple was marketing the iPhone had made hacks inevitable. "It set the challenge that the iPhone was unbreakable and the temptation was too much. A small army of hackers started work on this project as soon as it was launched," he said. The fact that the iPhone can be bought off the shelf without signing up to a mobile contract, coupled with the decision to launch it with a single operator in the US and the UK, have added to the reasons why hackers are keen to open the platform up, said Mr Wood. Apple is planning to release its next software update - which will allow users to purchase music from the iTunes store via a button on the iPhone - next week. It has said it wants to "continuously delight" users with new iPhone features.